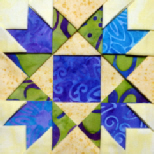 3D Folded Blocks has over a dozen patterns and is a resource for SEVENTY 4" folded blocks. The blocks are created by folding bits of fabric into a variety of shapes, and layering them. The only stitching is done around the outside edge of the block! Folded blocks have been around for a long time, and we've had lots of fun making them in our workshops. But, aside from a great little Dutch booklet of fifteen blocks by Liesbeth Noordhuis, we really couldn't find another good source for them. So, a few winters ago we began converting more traditional blocks into folded ones and designing projects to showcase them.